Heat oven to 350°F. Spray 2-quart casserole with nonstick cooking spray. Prepare rice mix as directed on package, omitting margarine. 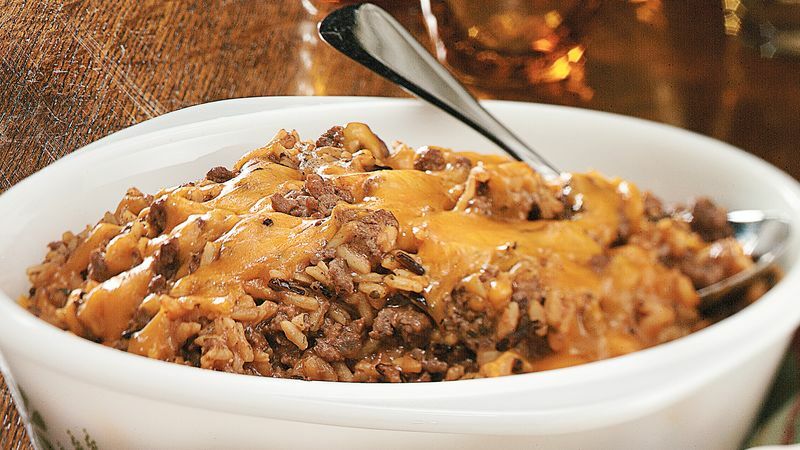 Meanwhile, brown ground beef in medium skillet over medium-high heat until thoroughly cooked, stirring frequently. Drain. Add soup, milk, pepper and cooked rice mixture; mix well. Spoon into sprayed casserole. Cover. Bake at 350°F. for 30 minutes. Uncover; sprinkle with cheese. Bake, uncovered, an additional 5 to 10 minutes or until cheese is melted. Wild rice is a long-grain marsh grass that is native to the northern Great Lakes. It is now commercially grown. In this recipe, we call for a quick-cooking mix to minimize the time it takes to prepare wild rice. Serve this casserole with sautéed zucchini slices and whole grain dinner rolls.